Home / UncategorizedMirror Bed side table! 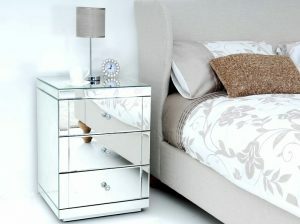 Designed with incredible ingenuity and stunning contemporary flair, mirrored nightstands exude irresistible charm. Crafted with precision, each side table has undeniable appeal that adds both visual and textural contrast to your bedroom. Finding that ideal balance between flowing form and function is ideal to decorate your bedroom and a mirrored sidetable adds that touch of luxury you seek for. ← What’s New: Kohler’s ‘Sensate’ Kitchen Faucet Supports Apple’s Home Kit Platform!